Home > Heavy Duty V Belts > Moulded Notch V-Belts. AX, BX, CX, 3VX and 5VX Sections. > BX Series. 21/32" WIDE COGGED V-BELTS (TRI-POWER/KING COG/PRIME MOVER) > BX112 Molded Notch V-Belts. BX Cogged Series. > B112 Power King V Belt. Classical B112 Industrial V-Belt. B112 Power King V Belt. Classical B112 Industrial V-Belt. B112 BANDO Power King Belt. Classical B112 Industrial V-Belt, 21/32” (5/8”) Wide x 115” Length OC (16mm W x 2845mm L OC). Features bias cut, insulated ultra-high strength polyester cords, superior compression section for high temperature and load carrying performance. Heat and oil resistant. High quality for low cost! NAPA, Grainger, PIX (low grade) B112. Bercomac 103010 belt, snow thrower. REPLACES (Ariens/Gravely) Everride BELT, HB 114.9 EL AMD. B112KC Ultrapower V Belt. Kevlar B112 Industrial V-Belt. B112-KC Ultrapower V Belt. Kevlar reinforced B112 Industrial V-Belt. 21/32" (5/8”) Wide x 115” Length OC. 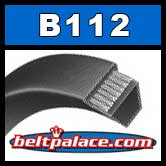 Superior replacement for Standard Raw edge B112 and 5L1150 FHP V-Belts. BX112 Molded Notch V-Belts. BX Cogged Series. BX112 Molded Notch V-Belts. BX Cogged Series. 21/32" Top Width (5/8") x 115" Length OC.